Ever notice that when your kids grow out of needing help with one task, a new one sprouts in its place? You trade bedtime stories for math homework. You no longer have to help your offspring use the potty—but you have to remind them to take showers and wear deodorant. And in my house, you stop making school lunches and start packing on-the-go dinners instead—because on Mondays my 11-year-old daughter is at the ice rink from 5 to 7 p.m. Some Tuesdays, my 8-year-old son goes directly from viola lessons to hockey practice. Every other Wednesday, I have my own dinner-hour meeting. Thursdays, my husband takes a workout class. And so on. Family dinners can usually only happen on weekends and alternate Wednesdays. But I still want my kids to eat well all week—and all day. Here’s how I make that happen. Breakfast: The morning meal is almost the only must-do we tackle before school. We’ve already finished homework, made lunches, chosen clothing, and stuffed backpacks the night before. In the morning, all we have to do is eat, brush hair and teeth, and go. Breakfasts are quick and easy: cereal, toast, and so on. If my husband is home, he’ll whip up scrambled eggs. But the rule is that everyone must have some fruit and some protein. My daughter recently went on a green smoothie kick, so I jumped right on that, making sure we always had leafy greens and frozen fruit on hand. Lunch: Both my kids eat school lunches often, which I’m OK with because I know they have salad bars in their cafeterias—and actually use them. When my daughter started middle school, and had a lot more choices in the lunchroom, we talked about which offerings were tasty and healthy. 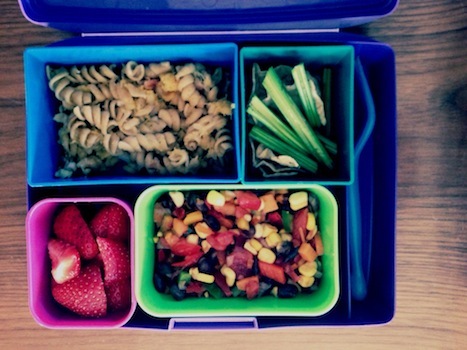 If my kids do brown-bag it, they know to include fresh fruits and vegetables, lean sources of protein, and whole grains. They also know to grab the same kinds of foods for snacks, whether at home or packed to go. (As the family grocery-shopper, it’s my job to make sure these are available in our refrigerator and pantry.) Dinner: When the kids’ activities overlap with the dinner hour, they take a meal with them. We get the occasional curious stare at the ice rink, but there’s no way I’m going to let them eat from vending machines and drive-thrus several days a week—every week! I pack leftovers, or the same meal the rest of us will be eating that night, or something simple like a plain quesadilla. The meal pictured here contains: whole wheat pasta with acorn squash and bacon (left over from a Sunday dinner); homemade salsa with corn, tomatoes, black beans, onions, and bell peppers (also prepped on the weekend); celery sticks and tortilla chips for dipping; and strawberries. When she has a two-hour skating practice, my daughter will eat a little of her meal on the way there, and most of the rest during her half-time break. She’s learned how much she can eat and still skate comfortably. For most kids, a smallish carbohydrate snack about an hour or two before a one-hour practice or game does the trick. Adding protein or fiber helps slow digestion, which in turn sustains your tween’s energy level. We avoid foods high in fat and sugar all the time, but especially before exercise. 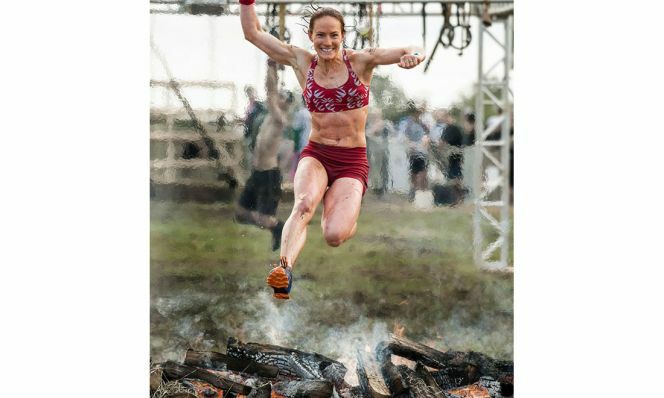 Catherine Holecko is the Family Fitness Expert at About.com. She lives in Wisconsin with her tweens, husband, dog, and about 10 pairs of ice skates.